It’s been a meaningful and surprising week here at Herzl Camp. Together, we’ve had a lot of fun, we’ve learned, and we’ve grown. Appropriately enough, as this Shabbat approaches, growth is exactly what I want to discuss. The shoes that you wear are indicative of the environment you work in. I’ve found it’s fairly simple to look at one’s shoes and identify where they have been or where they are going – Try it today as you go about your day. Whether it’s flip-flops, running shoes, rain boots, or the beloved camp crocs, each pair of shoes has it’s own unique story. While I look back and reflect over my camp career, I can’t help but appreciate how camp’s mission has evolved just as our shoe choice has. Ok, I know it sounds funny…but hear me out! When I first began as a bunk staff here at camp, it was the norm to see toes flashing as campers and staff alike energetically traveled from point A to B. I, too, used to wear the general counselor outfit – you know the one: running shorts, a t-shirt you don’t care about getting dirty, flip-flops, etc). However, as camp and I evolved over the years, and as I took on new roles such as Program Director, Mama Ozo, and now Associate Director, the transition from open-toed to closed-toed shoes has been as clear as Devil’s Lake on a Shabbos Morning for both our staff and campers. 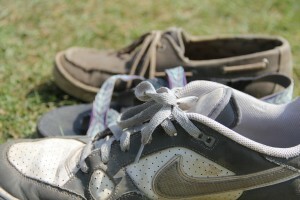 You see, tennis shoes stand for so much more than just pieces of leather. They signify resilience, ambition, a readiness to take on the world (or at least a kickball game in the sportsfield). Flip-flops shout to the world that you are limited in what you can do right now – how fast and how far you can go. For our staff, wearing tennis shoes is a conscious decision. It shows a desire and a readiness to be everywhere and to try new things. Tennis-shoe-wearing is rooted in a genuine interest to build commonalities with campers and to develop meaningful relationships – the heart of camp and a successful summer. With all that goes on in a week of camp, let alone a day, it is important for staff and campers to be up for whatever is thrown our way – whether that be a frisbee or an opportunity to step out of our comfort zone. Sometimes we have to understand that camp can be a rollercoaster of emotion. Between making new friends, the disappointment of losing an ultimate game, and everything in between, it is important to learn the resilience that comes along with rolling with the punches and wearing tennis shoes is the first step to achieving this. While it may be easy to wake up from minucha (rest time) and slip on a pair of flip-flops, I have learned that taking the extra time to lace up some tennis shoes can go a long way – and rather than simply talking the talk, I, along with all of our staff, set out to exemplify this each day by walking the walk (literally). Following this theme, campers have woken of every morning with a willingness and enthusiasm to lead and join in on activities, rise to challenges, and try new things – in other words, they’ve really been wearing their tennis shoes. Kadimah has been holding auditions for their play, B’yachad has been participating in Chaverim (working and building relationships with Ha’atid), Tzofim completed a mega-scavenger hunt across camp, and Ha’atid put on a talent show for one another. Wearing tennis shoes has its benefits in the camp world and their power stretches far beyond Webster, WI. Our goal is for campers recognize the opportunity in every situation and are ready to jump in – whether at camp, at school, or at home. Our goal is to instill a certain Herzl-style zest for life in our campers so that they will take on each day with ruach and passion. We want all of our campers to learn to wear tennis shoes.